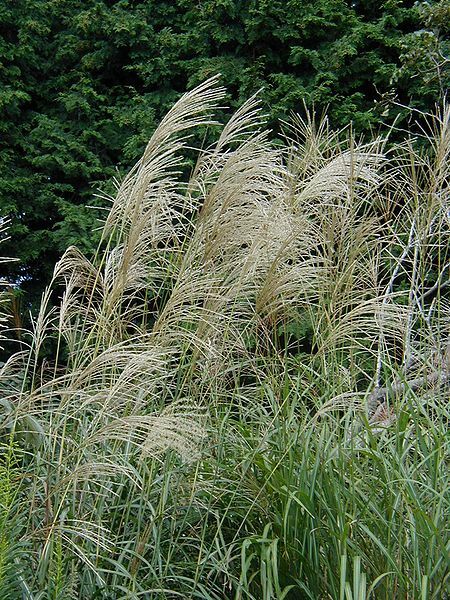 Miscanthus sinensis is a perennial C4 grass (Horton et al. 2010), 2-3 m tall, in large tufts, stout. Leaves alternate, to 1 m long, 1 cm wide, margins raspy, mostly on lower half of stem. Flower spikelets in pairs, 1-flowered, glumes 0.3-0.4 cm, above a ring of long hairs, lemmas shorter than glumes awned to 0.6 cm; inflorescence 10-20 cm long with branches in a fan-shaped pattern, whitish-hairy, Sept.-Nov.
Habitat: Escaped from cultivation or planted in open natural areas, soil pH 4.6-7.5, tolerant of fire, moderately tolerant of drought, intolerant of shade, salt (USDA, NRCS 2010).